Sunday, October 28, 1:30 p.m.
COLLEGE STATION, Texas — Texas A&M (12-10, 5-5 SEC) begins a three-match road swing Sunday as the Aggies take on 24th-ranked Missouri (19-4, 9-2 SEC) in Columbia. First serve is at 1:30 p.m. at Mizzou Arena, and the match will be streamed on SEC Network +. The Aggies have played four consecutive five-set matches and are coming off three consecutive hard-fought, 3-2 setbacks, including a 19-25, 25-14, 25-16, 14-25, 15-10, loss against Alabama on Friday to close out a three-match homestand at Reed Arena. Missouri is riding a season-best seven-match winning streak and improved to 8-0 in home matches with a 3-0 (25-21, 26-24, 25-12) victory against LSU on Friday at Mizzou Arena. Texas A&M owns a 30-15 lead in the all-time series against Missouri since the teams first met in 1981. Missouri has won the last two meetings after sweeping the home-and-home series last season. The Tigers defeated A&M, 3-1 (21-25, 25-22, 25-12, 25-22) at Reed Arena on Sept. 24, 2017, to snap a five-match losing skid against the Aggies, and they also defeated A&M, 3-0 (25-23, 25-23, 25-19), on Nov. 3, 2017, at the Hearnes Center to complete the season series sweep. In three of the last four meetings, the team that lost the first set came back to win the match. The series is tied, 10-10, in matches played in Columbia. A&M holds a 6-4 edge since the teams joined the SEC in 2012. In the 16 years as members of the Big 12 Conference, A&M led the conference series, 21-11, although Missouri closed out Big 12 play with three consecutive wins against the Aggies. In the most recent meeting, Texas A&M dropped the first two sets by the minimum two points against Missouri, and the Tigers pulled away late in the third set to defeat the Aggies, 25-23, 25-23, 25-19, on Nov. 7, 2017, at the Hearnes Center in Columbia, Missouri. Senior outside hitter Kiara McGee led the Aggies with 12 kills and 15 points, and setter Camille Conner finished with 29 assists. Libero Amy Nettles had a team-high 16 digs, and sophomore middle blocker Maddie Douglas led all players with a career-high seven blocks. McGee added a personal season-best four blocks as the Aggies led in blocks, 12-10, against the Tigers, who entered the weekend ranked eighth in the nation in blocks per set. Missouri, which outhit A&M, .202 to .115 for the match, was led by Leketor Member-Meneh, who had 12 kills while hitting .500. A&M’s most historic meeting in the series was at Missouri on Nov. 25, 2015. In a match with SEC championship implications on the line for both teams, Texas A&M needed to defeat Missouri to clinch its first-ever conference championship. The Tigers, who were entering the match 10-0 on their home court, were in a must-win situation in order to stay in the hunt for at least a share of the championship title with one match remaining for each team. Missouri built a 2-1 lead in sets and had the momentum after taking a 22-18 lead in the fourth set. The Aggies then went on to reel off seven unanswered points to close out the frame and force a fifth set. The Aggies took a 4-2 lead in the fifth set after a 3-0 run and never looked back, winning the set, 15-10. With 12 wins on the season, A&M already has two more wins then it totaled in the entire 2017 season. A&M is 0-3 against ranked opponents this season, including narrow 3-2 losses against No. 11 Florida and No. 15 Kentucky. A&M enters the Missouri match having played four consecutive five-set matches. The match against Alabama on Friday marked A&M’s record-setting seventh SEC five-set match this season, breaking the previous record of six five-set matches played in both the 2012 and 2014 SEC seasons. A&M has played nine five-set matches in 2018, tying the school record for most five-set matches played in a season in the 25-point scoring cap era. Four of A&M’s five conference losses have been in five-set matches. A&M has lost its last three matches, marking the team’s longest losing streak of the season. For the season, A&M is 6-2 in three-set matches, 3-2 in four-set matches and 3-6 in five set matches. In SEC matches only, A&M is 2-0 in three-set matches, 0-1 in four-set matches and 3-4 in five-set matches. Texas A&M is 2-2 in SEC away matches and 2-6 in all true road matches this season. The Aggies are third in the league in aces (1.33) per set in conference matches only. A&M is outhitting its opponents, .226 to .194 in all matches and .219 to .213 in SEC matches only. A&M fell from 64 to 78 in the most recent NCAA RPI (rating percentage index), released on Monday. Hollann Hans entered the weekend ranked 10th in the nation in aces per set, 12th in points per set and 15th in kills per set. Hans is the SEC leader with 5.14 points per set in all matches. She leads the SEC with 5.26 points per set in conference matches only. She also leads the SEC with 0.58 aces per set in conference play and is second in the league with 0.49 aces per set for the full season. Hans has posted double-figure kills in 19 of 21 matches played. She has recorded 20 or more kills in 11 matches, including in three of the last four matches. Hans now has 959 career kills and needs 41 more kills to become the 19th player in program history to join the 1,000-Kills Club. Hans recorded the first 20-20 performance of her career with 22 kills and a career-high 21 digs against Tennessee on Oct. 19. Hans’ 34 points and 32 kills at Florida on Oct. 5 smashed the previous Texas A&M records for most kills and most points in a match in the 25-point scoring era. She had set the previous record with 28 kills and 32.5 points against Penn State in 2017. Her 32 kills and 34 points are the most by an SEC player in a conference match this season. Hans served a school-record eight aces in A&M’s 3-2 win over Georgia on Sept. 23, breaking the previous A&M all-time record of six, reached 12 times, most recently on August 30, 2013, by Allie Sawatzky against South Dakota State. Hans’ eight aces against Georgia are the most by an SEC player in a match this season and tie for second in the nation for most aces in a five-set match this season. Hans has served at least one ace in each of the last 11 matches. She had two aces against Alabama to give her 26 for the SEC season, breaking the previous school record of 24 aces in an SEC season, which she set last year. Hans, only a junior, already has a school-record 67 aces in her SEC career, shattering the previous record of 46 set by Shelby Sullivan (2012-15). Sophomore setter Camille Conner, and freshman middle blocker London Austin-Roark are the only two A&M players who have started every match this season. Conner is the only player who has appeared in all 89 sets. Conner is third in the SEC with 10.11 assists per set for the full season and is fourth in the league with 9.89 assists per set in SEC play only. Conner is second on the team and tied for sixth in the SEC with nine double-doubles in all matches. She is second on the team and tied for third in the SEC with six double-doubles in SEC matches only. Team captain Amy Houser, the only senior on the team, has started every match as the designated libero and has played the position in all but one set. Amy Houser, who celebrated her 22nd birthday on Thursday (Oct. 25), has reached double-figure digs in 14 consecutive matches and 19 matches overall this season. Houser has tallied 20 or more digs in a team-leading six matches. Houser is seventh in the league with 3.89 digs per set for the full season. She is No. 8 in the SEC with 3.84 digs per set in SEC matches only. Houser’s point-saving play at set point in the third set at Georgia on Oct. 14 was No. 5 on ESPN SportCenter’s Top 10 plays of the day and was NCAA Volleyball’s No. 2 play of the week. Houser recorded the first double-double of her career in the 3-2 win at LSU (Sept. 30), posting a career-high 11 assists and tying her career best with a match-high 24 digs. Houser has a team-high 475 service receptions. She also has a team-best .966 service reception percentage among players who have at least 15 reception attempts. Houser had a match-high 19 digs in the three-set victory over Arkansas, tying a school record for most digs by an A&M player in a three-set SEC match. Middle blocker London Austin-Roark leads A&M and is tied for ninth in the SEC with 1.00 blocks per set in conference matches only. She leads A&M with 72 total blocks and 0.84 blocks per set in all matches. Austin-Roark, who has started all 22 matches, had a career-high nine blocks against Georgia on Sept. 23. It still is the most blocks by an A&M player this season. Sophomore middle blocker Makena Patterson leads A&M and is ranked sixth in the SEC with a .345 hitting percentage in conference matches only. Patterson has recorded double-figure kills in each of the last two matches, including a career-high tying 13 kills while hitting .393 against Alabama on Friday. Over the last five matches, Patterson is hitting .438 an­­d averaging 2.20 kills per set. After having appeared in only one match over the first nine matches of the season, sophomore opposite hitter Samantha Sanders has appeared in each of the last 13 matches. She tied her season high and recorded her fourth double-digit kill performance of the season with 11 kills against Tennessee (10/19). Sophomore Morgan Davis was the unsung hero in the win at Georgia. Davis, who has trained only at opposite hitter this season, subbed in at middle blocker late in the fourth set against the Bulldogs and finished the match with four kills­—including a team-leading three kills in the decisive five set—without an error to hit .800 for the match. Davis also subbed in at middle in the two matches following the Georgia contest. Against Tennessee, she posted a personal season-high five blocks, including two solos, the most solo blocks by an A&M player this season. Davis returned to the right side against Alabama and had a career-high five digs. Freshman defensive specialist Allison Fields, who played libero in the final set in the sweep against Nicholls, has started 20 of 22 matches and has posted double-figure digs 11 times, including a career-high 20 digs against Missouri State. Freshmen defensive specialist Taylor Voss has seen action in 19 matches and 70 sets, typically as a server for a middle blocker. 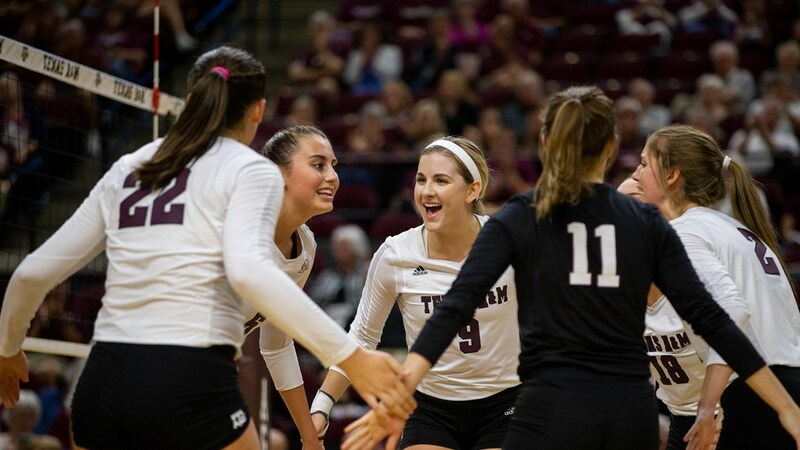 Freshmen middle blockers London Austin-Roark and Mallory Talbert and freshman lefty setter Kaitlyn Rogers all graduated high school early and participated in A&M spring drills and also went on the team’s foreign training tour to Europe in May. Missouri (19-4, 9-2 SEC) is riding a season-best seven-match winning streak after defeating LSU, 3-0 (25-21, 26-24, 25-12) on Friday at Mizzou Arena. Missouri broke into the AVCA Top 25 for the first time this season on Monday, coming in at No. 24. The Tigers made the jump following a 3-2 victory at No. 11 Florida on Sunday. Missouri is in third place in the SEC standings, only a half game behind second-place Florida. Missouri is second in the SEC with a .156 opponent hitting percentage for the full season. Senior middle blocker Alyssa Munlyn leads the SEC with 1.38 blocks per set in all matches. Munlyn is hitting a team-leading .385 for the full season. Sophomore outside hitter Kylie Deberg is the reigning SEC Player of the Week and the SEC Offensive player of the Week after posting a career-high 21 kills and 26 points in the Tigers’ upset win at No. 11 Florida. She leads the Tigers and ranks seventh in the SEC with 3.55 kills per set for the full season and 3.78 kills per set in conference matches only. Redshirt freshman setter Andrea Fuentes is the reigning SEC Freshman of the Week after posting a career-high 47 assists against the Gators. A win against the Aggies would give Wayne Kreklow his 300th victory as head coach of the Tigers. Texas A&M plays its second match of a three-match road swing on Wednesday, Oct. 31, at Auburn. First serve against the Tigers is at 7 p.m. at Auburn Arena, and the match will be televised on SEC Network.